The sun emerged just in time for the motos, but the track was still predominantly wet. 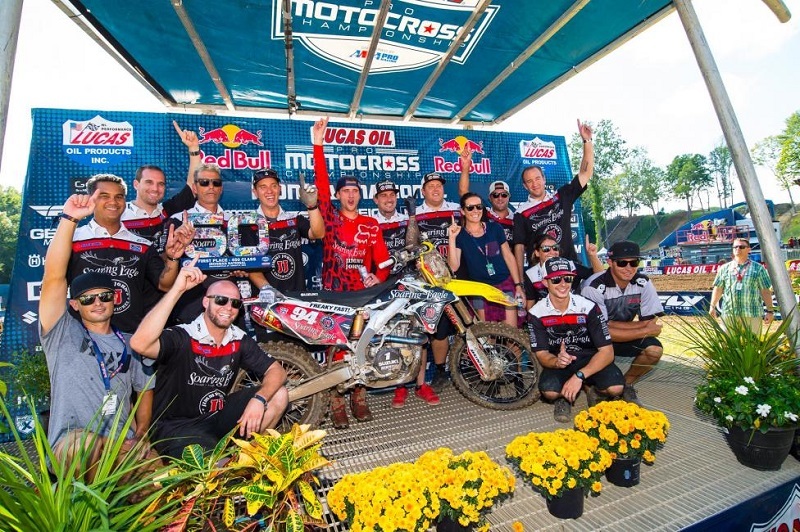 Fresh off his second title in three years, Roczen put his Suzuki out front to start the opening 450 Class moto, claiming the holeshot ahead of the Autotrader/Monster Energy/Yamaha duo of Justin Barcia and Phil Nicoletti. Roczen and Barcia set an impressive pace on the opening lap and were able to open a small gap over the rest of the field. That put Nicoletti in a fight for third with Red Bull KTM’s Marvin Musquin, with the two riders engaging in a spirited battle for the position until Musquin took over the spot on Lap 2. Barcia was able to keep Roczen honest for a few laps, with just over a second separating to two. However, as the moto wore on the champ was slowly able to build on his advantage. Behind them, Musquin rode solidly in third for the majority of the moto, but just after the halfway point Monster Energy Kawasaki’s Eli Tomac started to inch closer to the rear fender of his KTM-mounted rival. Tomac’s use of outside lines allowed him to maintain momentum on the rough, slippery track and it ultimately carried him past Musquin. The Frenchman attempted to fight back and they raced side-by-side briefly until Tomac finally took over the spot on Lap 7. The Kawasaki rider maintained his hold on a podium position for two laps until a small crash allowed Musquin to reclaim the spot, with Tomac remounting in fourth. Tomac was able to recover from his misfortune and close back in on Musquin, taking advantage of a lapped rider to move back into third with two laps remaining. Roczen led wire-to-wire to earn his 19th moto win of the season, crossing the line just over six seconds ahead of Barcia. Tomac rode to a resilient third-place finish, with Musquin fourth and Rockstar Energy Husqvarna Factory Racing’s Jason Anderson fifth in his first race back from injury. In the final race of his successful 16-year career, BTO Sports/WPS/KTM’s Andrew Short went out on a high note by grabbing the holeshot to start Moto 2, just ahead of Barcia and Tomac on a dry track. Barcia quickly overcame Short to take over the lead, bringing Roczen and Musquin along with him. A bobble slowed Barcia momentarily and allowed Roczen to dive to the inside and take over the lead. Barcia did all he could to keep Roczen within reach, but the Suzuki rider soon pulled away and never looked back, while Barcia asserted himself into second. Musquin held onto third through the first half of the moto but was then forced to deal with a hard-charging Tomac, who started sixth. The Kawasaki rider closed in on his French counterpart and moved into third on Lap 5. Once in podium position he was able to pull away, while Musquin then battled with Anderson for fourth for several laps before ultimately securing the spot. Roczen went on to lead every lap and took the checkered flag 19.7 seconds ahead of Barcia, who enjoyed his best race of the season. Tomac followed in third. Roczen’s 1-1 put him atop the standings for the ninth time this season and the 15th time in his 450 Class career, moving into a tie with legend Jeremy McGrath for eighth on the all-time wins list. He also became the first multi-time winner at Ironman Raceway, winning the inaugural race back in 2014. Barcia posted his single-best outing of the championship to earn back-to-back runner-up finishes to close out the season (2-2). Tomac rounded out the overall podium in third (3-3). Roczen finished the season with an 86-point lead over Tomac in the final 450 Class standings. His 584 points is the fourth-highest point total a rider has achieved in the premier division in Pro Motocross history and is the most since 2008 when James Stewart earned 600 points during an undefeated season. Musquin wrapped up third in the final standings (-183). The opening 250 Class moto got underway with Forkner racing to the holeshot ahead of Troy Lee Designs/Red Bull/KTM’s Mitchell Oldenburg and newly crowned champion Cooper Webb aboard his Yamalube/Star Racing Yamaha. Webb was able to make an early pass on Oldenburg to take over second, and as he looked to follow Forkner into a corner he abruptly lost momentum in a deep rut and tipped over, losing several positions. That allowed Monster Energy/Pro Circuit/Kawasaki’s Joey Savatgy to move into third, with Yamalube/Star Racing Yamaha’s Alex Martin right behind. Webb completed the opening lap in 13th place. A clear track proved to be a major advantage for Forkner, who established a comfortable lead after just one lap. Behind him, Martin was able to make the pass on Savatgy to take over second. However, they traded positions again on Lap 4 when a bobble by Martin allowed Savatgy to reclaim the position. By this time Forkner had moved out to a lead of more than 10 seconds, which would continue to grow as the moto wore on. While the top three eventually settled into their positions, simply looking to make minimal mistakes in the tricky conditions, Webb was on a tear back to the front. After breaking back into the top 10 on Lap 1, Webb continued his upward progression and soon found himself in a battle for fifth on Lap 6. After passing two riders in one turn on Lap 9, Webb sat fourth and set his sights on his teammate Martin for third. He closed in on Martin in the late stages of the moto and as he attempted to take an inside line for the position, Webb’s bike lost traction in the slippery conditions, which sent the champion flying into the ground. He was able to get back on the bike quickly and maintain his hold on fourth, but was forced to remove his goggles. Out front, Forkner cruised to his second career moto win by nearly 29 seconds over Savatgy in second, while Martin survived Webb’s late pressure to finish third. Monster Energy/Pro Circuit/Kawasaki’s Arnaud Tonus was able to take advantage of Webb’s lack of goggles to make the pass for fourth on the final lap, with the champ rounding out the top five. Forkner made it a clean sweep of the holeshots in Moto 2, edging out Yamalube/Star Racing Yamaha’s Aaron Plessinger, the defending race winner. Plessinger’s momentum carried him into the lead, with Forkner second and Webb third. As the field jockeyed for position on the opening lap, Webb was shuffled back to fifth, with Monster Energy/Pro Circuit/Kawasaki’s Adam Cianciarulo third and Martin fourth. A near crash slowed Plessinger’s momentum on the opening lap, allowing Forkner to move into the lead once again. Not long after that Webb fought his way back into third, passing both Martin and Cianciarulo. Forkner and Plessinger proceeded to pull away from their competitors, with Forkner securely in control despite Plessinger following just a few bike lengths back. As the leaders continued to pace one another, Star Racing teammates Webb and Martin suddenly found themselves in a battle for third after Webb crashed and lost all of the advantage he held over his teammate. Webb held Martin off and eventually pulled away again. Out front, Plessinger was starting to close in on Forkner and apply pressure on the lead. As the pair crossed the finish line to complete Lap 8 Forkner crashed, allowing Plessinger to slip past and assume control of the lead. Forkner was able to get back on the bike in second, but the time he lost allowed Webb to challenge him for second. After initially holding off the champ, Forkner eventually lost the position on Lap 10. Plessinger led the remainder of the race to earn his first moto win of the season at the track in which he broke through for his first career victory one year ago, crossing the line 12.7 seconds ahead of Webb. Forkner settled for third, but would end the afternoon on top. With his 1-3 scores Forkner became the sixth different overall winner in the 250 Class this season and the 80th different winner in the history of the division. It’s the third time this season a rider has broke through for the first overall win of his career and gives Ironman Raceway first-time event champions for back-to-back seasons. Star Yamaha teammates were locked in a three-way tie for second, with Plessinger’s moto win ultimately landing him in the runner-up spot (8-1) followed by Webb in third (5-2). Martin’s fourth-place finish in the final moto left him off the podium in fourth (3-4). Webb finished the season with a 73-point lead over Martin in the final standings, with Martin earning a career-best result. Despite finishing ninth overall (2-34), Savatgy clinched third in the final standings for the second straight season (-112), just seven points ahead of Forkner in fourth. The 2017 Lucas Oil Pro Motocross Championship will get underway next May. The 2017 schedule will be announced in the near future. Does Your Motorcycle Listen to You? Kawasaki Developing Artificial Intelligence in Bikes.